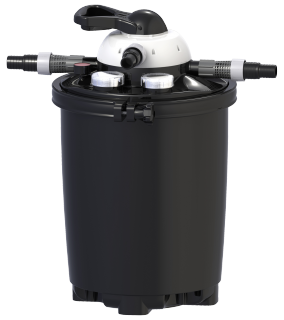 A pressure filter is a compact filter, very user-friendly and easy to clean. The filter takes care that the pond water remains clean and clear. A pressure filter is particularly suitable for ponds with streams, waterfalls or fountains. How does a pressure filter work? A pressure filter consists of a round container with filter materials. On top there is a cover with hose connections and the operation. Water is pressed through the filters under pressure of the pond pump. 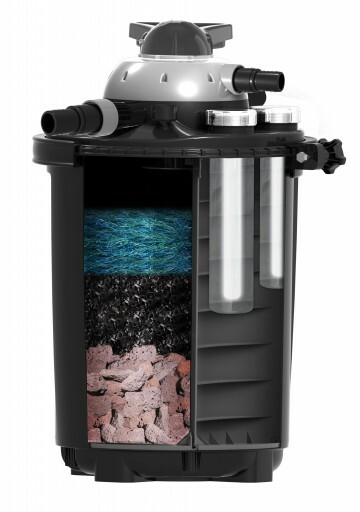 With the help of bacteria the filter removes the dirt particles from the water. Subsequently the water is pumped back through the hose in the pond again. As the pressure filter can properly stand high pressure, it is capable to bridge a difference in height. It is therefore ideal, when applied in combination with a waterfall or fountain in your pond. Connecting a pressure filter is not difficult. A pressure filter can be installed both under and above water. If you purchase a proper filter, it will always be accompanied by a clear and usable manual. As a pressure filter functions with high pressure, it is wise to purchase a properly functioning one. It will last longer, require less maintenance and present less problems. Besides you should reckon with the content of your pond. A pressure filter is used in ponds having a content ranging from 10,000 to 15,000 litres. A condition for the use of pressure filter is that there are few or no fish in your pond, but a sufficient number of plants, because the filtering capacity of a pressure filter is less large whereas plants help to keep a pond clean. You use a filter depending on the situation, wich may differ for each pond.